Today's world is complex and getting more so each day. Huge multinational corporations, international crisis and fast breaking events require most people to make decisions on a daily basis without the tools to understand the long term impact that today's decision might create. Because most people have never really been trained in how to make important complex decisions most people rely on experience, and 'gut reaction' which is okay for many decisions, but not okay for decision that will have meaningful impact on organizations and individual. Decision makers need to develop the art and science of strategic decision making. Here, Professor Thomas Martin explains the need for decision makers to modify their thinking about how they deal with acquiring and analyzing information in each of the decision-making process steps. This approach requiring thinking modification will lengthen the process, make it more complex, and to some more arduous, but the comprehensiveness of the new thinking approach should lead to improved and more effective decision making. 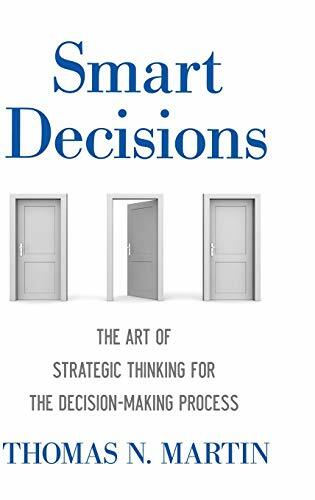 This book will appeal to decision makers, leaders, and students of management who want a specific framework that details the process behind making strategic, well-informed decisions.